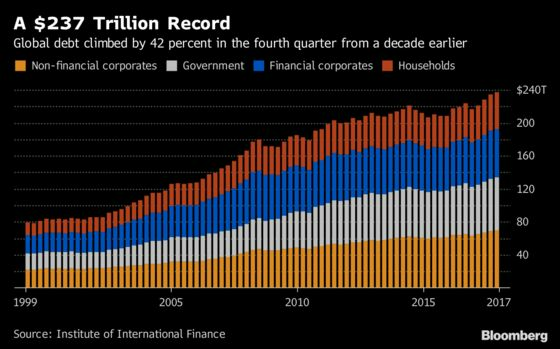 (Bloomberg) -- Global debt is becoming a bigger worry as the global policy tightening cycle takes hold, a top boss at the World Bank warned Monday. Central banks across the world are under pressure to follow a Federal Reserve that’s raising interest rates faster than initially anticipated, putting particular stress on emerging markets and developing economies. The need for structural policy changes, including responses to waves of anti-globalization, remains great as policy makers in most economies haven’t taken sufficient action during the extended period of low borrowing costs, Georgieva said. World debt, including household debt, ballooned to $237 trillion in the fourth quarter of 2017, according to calculations by the Washington-based Institute for International Finance. That’s more than $70 trillion higher than a decade ago. Georgieva said countries must take a hard look at the affordability of projects that they’re undertaking, including in infrastructure, amid still fairly low interest rates. She warned of the “white elephant” problem and said the World Bank is working harder to attract private-sector investors for “blended finance” projects.